Mason City schools offer a wealth of education and childcare services from pre-school to college level. Mason City also offers three excellent business schools. Child Care Resource & Referral of Northeast Iowa (CCR&R) is a community-based organization that lends a helping hand to people who care for and about children. Click or Tap for more information. 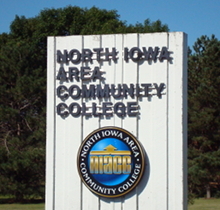 North Iowa Area Community College (NIACC) is a comprehensive learning institution positioned to serve as the major cultural, educational, and economic development force for the North Iowa region. 2018 marks the 100th anniversary of the College, which began in 1918 as Mason City Junior College (the first public two-year college in Iowa) and became North Iowa Area Community College in 1966. Buena Vista University is located on the campus of North Iowa Area Community College. The Mason City program offers 19 majors and secondary education endorsements in a variety of flexible formats. Kaplan University opens the door to new career training opportunities in Mason City, Iowa. Bachelors and Masters degrees range from Business Administration to Accounting, Criminal Justice, Nursing and many others. Mercy Medical Center - North Iowa Radiologic Technology Program. Under the direction of a physician, radiologic technologists apply their knowledge and skills in the detection and treatment of diseases, evaluation of broken bones and detection of other physiologic conditions. The revolution in technology and complexity of the equipment, plus the demand for properly educated personnel have contributed to the rapid growth in the profession. La James College in Mason City offers a cosmetology school, beauty college, massage therapy training, esthiology, and a nail technology program. The American Realty website contains a variety of links to other websites and references to resources available through government, nonprofit, private, and business sources. External links to websites from the American Realty website and references to non-American Realty resources are provided solely for informational purposes and the convenience of the user. American Realty does not control, review, approve, or endorse these sites, nor does American Realty control, review, approve, or endorse these resources. In addition, the external links and resources are in no way intended to represent an exhaustive listing or a special endorsement from American Realty. We're happy to help you relocate to North Iowa Contact an Agent at American Realty today!